Kristina Snow has found herself a new personality: Bree. Bree does all the things Kristina would never do, including drugs. After going away to visit her loser father, she is introduced to crank by her father’s neighbor. Soon Kristina’s life back at home with her mother spirals out of control. Skipping school, running away from home, being raped, getting arrested and being an all-around nightmare is all due to “the monster” of crystal meth. Once Kristina learns she is pregnant, not by her boyfriend, but by her attacker, she decides to have the baby and clean up. Unlike other novels in verse such as What My Mother Doesn’t Know, this book really deals with more gritty realistic issues like those of Go Ask Alice. Like many novels now, the topic is something shocking. 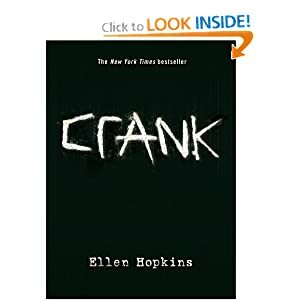 However, knowing that Ellen Hopkins wrote this after dealing with her own daughter’s drug addiction, I felt more interested. I wondered how Hopkins felt about the mother as she wrote her – does she think/know that her daughter felt the same way towards her during those times? School Library Journal reviews this by saying, “The poems are masterpieces of word, shape, and pacing, compelling readers on to the next chapter in Kristina’s spiraling world. 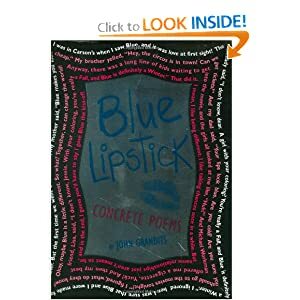 This is a topical page-turner and a stunning portrayal of a teen’s loss of direction and realistically uncertain future.” The power of the poetry and the intense subject matter make this work very well. What I love about these novels in verse is that you get straight to the heart of the issues and never have to wait for the author to get to the point. I now have the second book in the series, Glass. I’m glad Hopkins is putting out an adult fiction novel too. I’d love to see how this style of writing can work for the genre. Sophie Stein is a teenage girl who has two best friends, Rachel and Grace. She has a boyfriend named Dylan who is a good looking, popular boy, but the more she is around him, the more she loses interest. She is independent and artistic and when she is in art class she notices Murphy, the most disliked kid at her school. She strikes up a “relationship” with a guy named Chaz online who turns out to be a pervert. 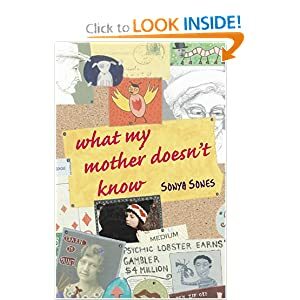 Her mother and father fight a lot and her mother retreats downstairs to watch soaps and cry – something Sophie thinks about doing herself but refuses to allow herself to sink into that same predicament. Instead, while her friends are away over break, she begins spending time with Murphy. Finally she finds a true connection with a boy whom she really likes – even if no one at school does. Vardell states, “A relatively new poetic form with roots in ancient epic poetry, the verse novel, or novel in verse is a form that is growing in popularity, particularly with middle school readers” (116). I had run into novels in verse such as this when I taught middle and high school English. Prose poetry novels, or Push Poetry was what it was referred to when I first heard of it. I was really excited and confused by how an author could get published by writing a book in simple language, in broken sentences and just fragmented scenes. But it was fascinating and I loved it. I understand how this is really cool for teen readers. I went on to read the continuing book through (Robin) Murphy’s point of view, What My Girlfriend Doesn’t Know. Next I will read her other books because I really enjoy this type of YA novel. I wonder how well it would translate into an adult fiction novel. Booklist (Nov 1, 2001) reviews this book positively by saying, “The poetry is never pretentious or difficult; on the contrary, the very short, sometimes rhythmic lines make each page fly. Sophie’s voice is colloquial and intimate, and the discoveries she makes are beyond formula, even while they are as sweetly romantic as popular song. A natural for reluctant readers, this will also attract young people who love to read.” I agree with the idea that this is great for reluctant readers. Since both Sones’ books about Sophie and Murphy can be good for boys and girls it may be something that they could easily get through. However, it is suggested that such books are use in “a promising trend and a fun format for dramatic read alouds” (Vardell 116). I would never feel comfortable having students in public school read these aloud, especially with the sexual content. I could, for the purposes to get students interested, read excerpts from the non-racy poems. I think these types of books would be a great alternative for students who simply don’t like to read or feel intimidated by so many words on the page. Nine brave souls and a two-headed rat enter the Monster Museum as part of a school field trip. They are assured by the tour guide that they will encounter “some creepy surprises” and they can read all about them in the brochure. The children see an ogre, a troll, a banshee, ghosts, a mummy, Count Dracula, Medusa and a zombie (just to name a few). Each monster has its own story and children can push the button to hear each display explain their predicament. Luckily, by the end of the tour, all the children (and the rat) have made it out alive and have some new, monster friends to take back on the school bus with them. As a poem picture book, this one really does a great job showing the reader who they are reading about. Vardell states, “In a poem picture book, the illustrations help provide on vision of the poem’s meaning. This can help introduce young readers to longer, narrative poems or classic works” (115). Using books such as this to show a silly side of poetry, but also give an intro to perhaps mythology, then we would get better visuals from readers. Even older readers who are not familiar with the story of Frankenstein or his monster without a name (though in the novel, the monster calls himself “Adam”) can get an idea of how these monsters and characters are perceived in popular culture. Kirkus Reviews (Sept 15, 2001) commented on the book by stating, “Singer’s poems are lively and humorous (if not great literature), and they impart quite a bit of information about various famous monsters. A “Glos-scary” offers excellent definitions of all the monster variations, with enough concrete information and background to satisfy the most committed monster maniac.” The glossary is another element of the poetic children’s books. It adds to the knowledge of the monsters. This would be an excellent transition into an activity where students could do research (even the beloved web-quests) on one of the monsters. 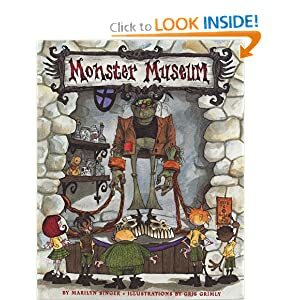 They could present their findings to the class and connect the poetic picture book story to the original story of the monster. Who wouldn’t love to write a report on Gremlins? Jessie is teenage girl who has a Mom and Dad, a cat named Boo-Boo Kitty, and a little brother Robert. Boo-Boo Kitty is on her side all of the time while Robert is on her side half of the time. Jessie has a few ups and downs with turning her hair blue, dealing with her little brother, getting to volleyball practice, putting up with cheerleaders and jocks, or having difficulty in her classes. But she ends up finding a bright side to all of her problems when her mother calls her a woman in reference to “every woman has a bad hair day” and when she discovers that Andrea is a cool guitar playing cheerleader. As a concrete poem book that has a central theme, it is a very well crafted book. As Vardell states, “Consider the theme or topic, organization and design, length and breadth, balance and variety of poems, use of illustrations, inclusion of reference aids, and appeal to the audience” (125). This book is centralized to the story of Jessie but the way the poems are all different is really exciting. Having to put your book up to a mirror and twisting it around in circles so you can read the poem is really a hands-on activity that really would engage a young reader. Voice of Youth Advocates (Aug 1, 2007) reviewed the book by saying, “Others seem to require a lot of eye gymnastics, which is more effort than some readers might want to exert for not getting a whole lot back. Teens might be enticed to pick up the book with its cover in the shape of a mirror poem with a shimmery silver background, but they will likely be disappointed that the voice wavers between authentic and adult-speak throughout.” I agree with this maybe be a bit too much for some readers, especially reluctant readers. However, it may have the opposite effect because the poetry is so small and the pictures would draw them in. Reluctant readers are constantly looking for the book with the least amount of pages and the biggest type when required to do a report. This could very well draw in a middle school female reader who isn’t a big fan or reading – especially poetry. Since most students aren’t big poetry fans at any age, I like that this can show how poetry can be fun. Amazon suggests that the companion book, Technically, It’s Not My Fault be read as well. I think that using books like this for poetry to be included in a Poetry Unit would really show a different type or poetry and a fun side to the genre. I would use this and Grandits’ other concrete poetry book to be read in class, in groups, discussed, then give students the opportunity to write their own concrete poems.